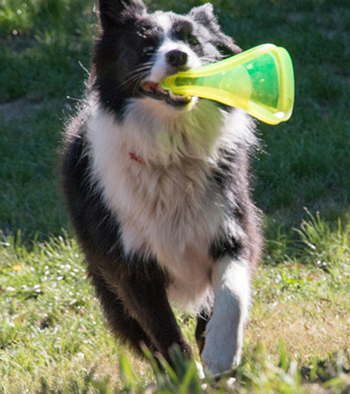 Winnie, our beloved black and white Border Collie dog, arrived as a puppy in time for Christmas, 2014. She's a lovely, gentle dog, and loves catching tennis balls, frisbees, and retrieving sticks from the pond. Initially Winnie was junior dog to Rusty the red Border Collie. She was top (and only) dog for a short time, before the arrival of her younger full sister Pebbles. The two siblings get on pretty well, but there are just a few dominance issues. Winnie hates conflict, so tends to hang back and give in. When we go on walks around the garden her favourite command is 'go round'. Winnie loves taking the long, alternative route, then reappearing up ahead. She looks so proud and smily! Here are some of her latest adult doggy photographs.